The parades were already being planned, people were getting out their credit cards to order shirts and hats, and it looked like the Falcons were more than ready to celebrate their first NFL Championship. 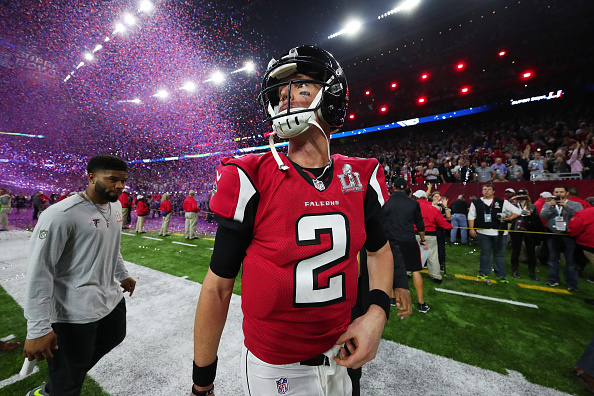 Then, as quickly as they built a 28-9 lead, it all fell apart, and in the end, the Falcons wilted like lettuce in the sun, and Atlanta will have to wait another year to try and celebrate their first championship after a 34-28 overtime loss. Super Bowl LI at NRG Stadium in Houston will go down as the hardest day to ever be an Atlanta Falcons fan. The team led 21-0, and in the fourth quarter it looked like they were well in control, and instead of getting the job done, they left just enough of an opening for the Patriots to come back. James White’s 2-yard touchdown run on the first series of the first overtime was the clincher for the Patriots, who seemed to just get momentum after the Falcons were unable to put the game away in the final quarter of regulation. They had a great shot to put the game out of reach up 28-20, as NFL MVP Matt Ryan hit Julio Jones with a sensational sideline pass to set up what should have been a game-clinching field goal a few plays later. Instead, a sack and then a hold pushed them out of field goal range, and the Falcons punted, giving Tom Brady who set records across the board the chance to come on the field and close out the comeback. Even after the Patriots scored, they still needed a final two-point conversion to tie the game, and not only did they get it, but the Falcons were offsides on the play as well. Once the overtime started after the Falcons were unable to move the ball in the final minute of the 4th quarter, you knew the outcome in overtime was pretty much decided. The Patriots drove 75 yards on eight plays for the winning touchdown in overtime, and it wasn’t even close, as the Falcons defense was go gassed it looked like they couldn’t stop a high school team by that point. They were also so deflated after blowing a 25-point lead, they just looked like a shell-shocked team that wasn’t quite prepared for the letdown that was about to happen. The Falcons had a chance to make the plays, and with a lead like that they should have been easily able to put the game away. Instead, they likely will be able to get somewhat a measure for revenge in seven months on opening night when they take on the Patriots in New England. It’s going to take a long time to figure it out – and for most Falcons fans, they likely never will.